It’s Yuri’s Night, the anniversary of the first human spaceflight. That means it’s time for a distributed planet-wide space-party, celebrating us puny humans braving the terrifying void of space! Top image: Gagarin strapped in and ready to blast off in Vostok 1. Vostok 1 did not look so hot when it landed in 1961. On April 12, 1961, cosmonaut Yuri Alekseyevich Gagarin (Ю́рий Алексе́евич Гага́рин) boarded a tiny spacecraft, strapped himself to a rocket, and jittered around the planet. For the next 108 minutes, he soared around the planet as the first flimsy, frail, squishy human to brave the hostile environment of space. Daisies: official flower of the laughing cosmonaut. When he landed, Gagarin instantaneously became an internationally recognized hero and celebrity. Fearing for the catastrophic publicity hit that would happen if he was lost in a space-related accident, he was banned from any further spaceflight and confined to cosmonaut training duties at Star City. He died in a recertification flight in 1968. Now, the anniversary of his flight is celebrated as Yuri's Night, a worldwide party celebrating space and exploration. Even cramming for exams looks more interesting when it involves spaceflight. Like any good story, of course Yuri’s First Flight is subject to historical nitpicking. His start and end points didn’t quite overlap enough to be a full orbit, so he’s more accurately the first human to be in orbit as opposed to complete an orbit, a title more accurately held by Gherman Titov, the fourth human in space, the first to fall asleep in space, and most glamorously of all, the first to vomit in space. Gagarin undergoing medical monitoring as part of his cosmonaut cadet training. 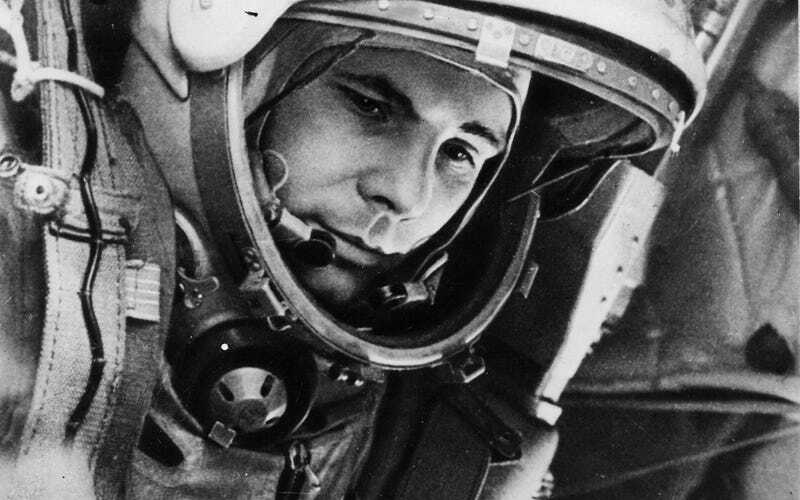 Gagarin also didn’t land in his spacecraft: a technical glitch forced him to jump out of his capsule at 7,000 metres or die. The choice would have disqualified him from a world-record attempt, so the official story for years was that he landed within the capsule. Even with these shades of grey scandal, Gagarin was indisputably the first person to open up spaceflight to mammals beyond monkeys, dogs, and mice, and ample justification for a party. Gagarin helping his daughter Galina with her bike on the streets of Star City. Last year we celebrated Yuri's Night by going into the historical details of the flight in a very earnest tribute to his bravery. This year we're going to go for something slightly different: bring on your craziest stories about the things astronauts have done in space. Going to space is hard, scary, and difficult, and the people who take on that challenge of exploration produce some spectacular stories. At NASA, we have everything from Alan Shepard’s prayer and moon-golfing to John Young smuggling corned beef, while even ground support can get a wee bit goofy by presenting iconic stuffed dogs as a good-luck charm for astronauts. Even cosmonauts have car trouble. The lingering secrecy and disinformation of the Cold War make it impossible to know exactly what happened with Roscosmos. Even so, just from stories like Alexey Leonov taking the first spacewalk and landing in a snowstorm surrounded by bears make it clear they had just as much going on, and that the first lady in space Valentina Tereshkova is still down with a one-way trip to Mars for her retirement project tells me that we’re bound to find some fantastic stories of outrageous cosmonauts. The first human in space is allowed to feed any elephant he wants. Tell me: what stories do you know about the history of spaceflight that leave you bemused, laughing, or filled with awe? Fluffy hats are mandatory for vacations in Crimea. Raise a glass, let out an exuberant “Poyekhali!” and share a story!